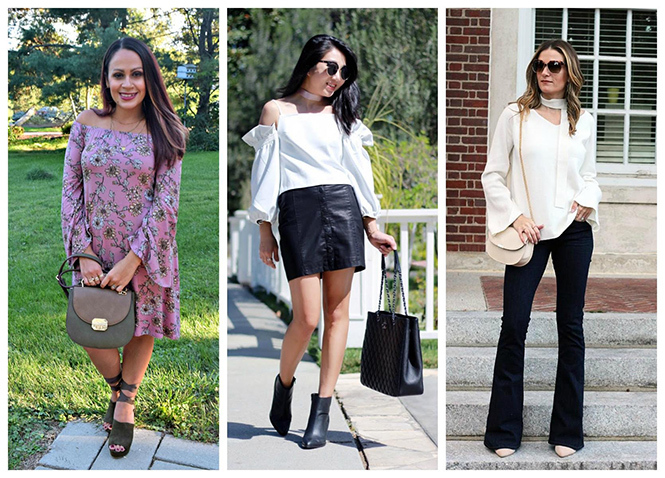 Is anyone else loving the bell sleeve trend this season? 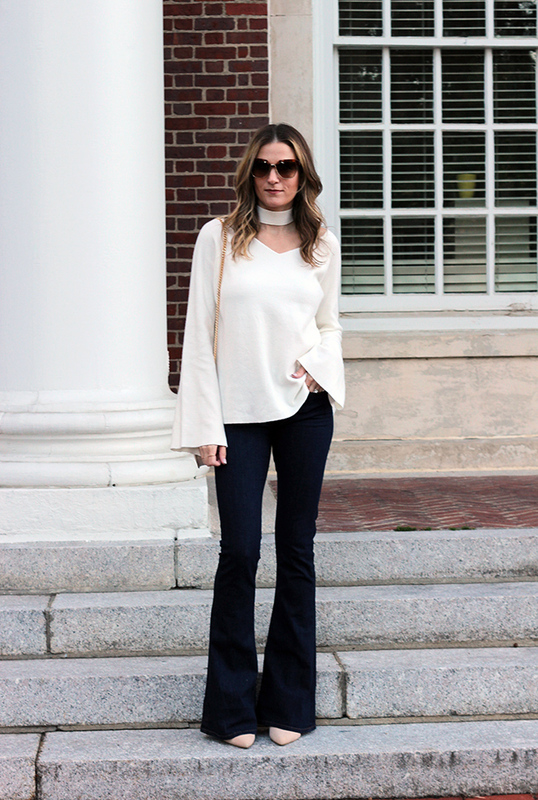 I have to admit that I'm quite obsessed with the look, and I wouldn't mind wearing big flares on my wrists everyday. If you are looking to try the trend, then this Chicwish sweater makes the perfect option. 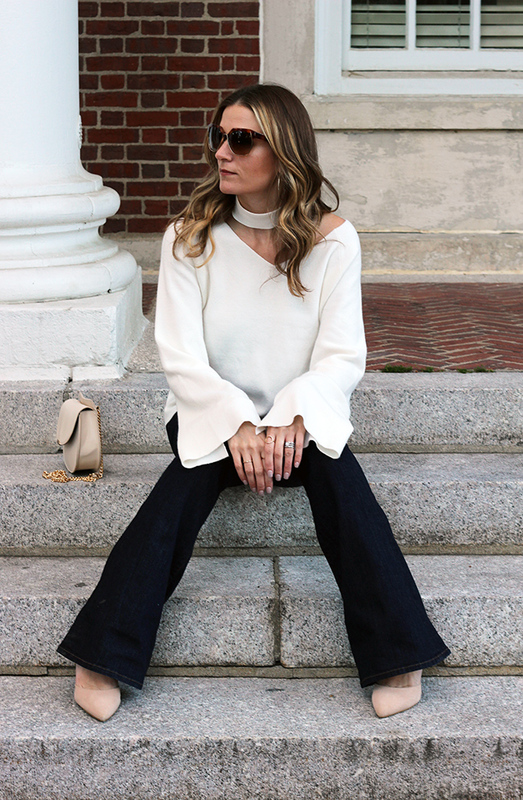 Not only is it one of the softest sweaters that I own, but the bell sleeves gives the basic v-neck a fun update. 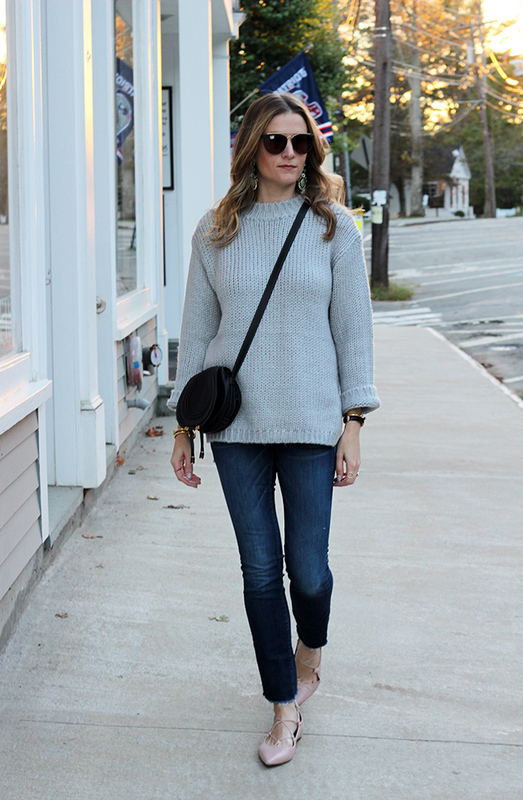 I paired this sweater with my favorite flare jeans, and matching necktie (which comes with the sweater) for a 70's feel, but have a feeling I'll be living in this sweater with my skinny jeans and flats all season. Now, I just have to learn how to not get my bell sleeves in my food every time that I eat! *This post contains sponsored content. All thoughts and opinions are my own. Thank you for supporting the brands that I love on Threads for Thomas. The feature blogger of the week is Lee from Legalleeblonde. 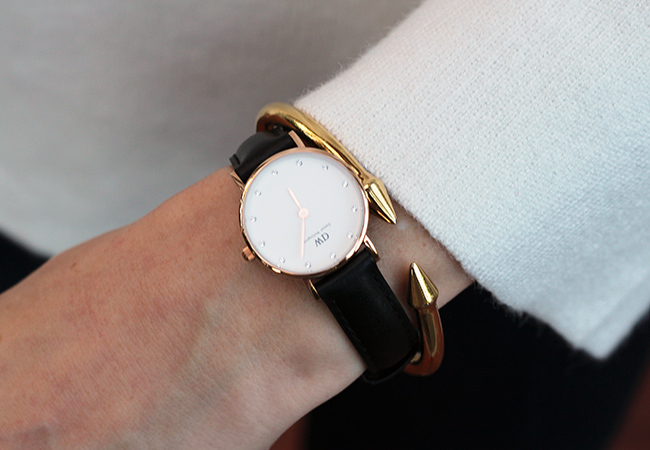 I love how she makes patten mixing appropriate for the office, and always look to her blog for professional style inspiration. Make sure to stop by and say hello! Well, autumn has officially arrived here in Boston. When I got up this morning, temperatures were only in the 40s, with a high today of 66 degrees. This is actually my favorite weather for dressing. I love when it's cool enough to to layer on a sweater, blazer or leather, yet warm enough to not need a winter jacket. 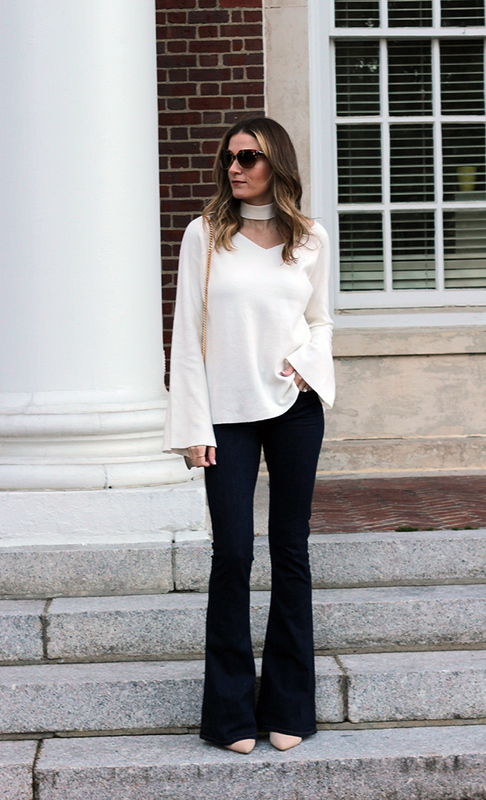 This cold shoulder sweater makes a perfect option for this fall weather. 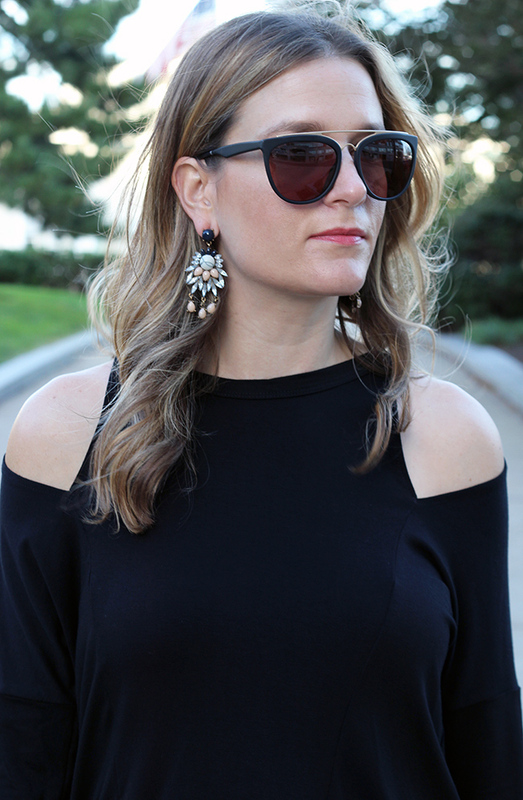 You all know I love anything that is shoulder baring, and wearing a cold shoulder cut sweater is the perfect way to transition the trend for the fall. I have to admit that when I ordered this sweater, I thought it was going to fit differently. From the photos, it looked to be an oversized fit, but when I took it out of it's packaging, I realized it was a cropped sweater. I wasn't disappointed though, because I love the fit just as much, as it makes a perfect layering piece. Since it is an open knit, I threw it on over a white tank, and added my high waist jeans for a trendy, yet comfy outfit. I also love the idea of wearing this sweater over a fitted dress, and adding OTK boots, for fun layered look. I hope everyone had a great weekend. We had a wonderful time at my brother-in-law (and now sister in law's) wedding. The twins were in the wedding, and too adorable walking down the isle. I'll be sharing the dress that I wore soon! *This post contains sponsored content. All thought and options are my own. Thank you for supporting the brands that I love here on Threads for Thomas. Happy Friday everyone! This weekend is an exciting one because my brother-in-law is getting married! To make it even better, I'll be attending my first Chinese wedding. As many of you may know, my husband is Chinese, and although we've been together for fourteen years (four of those married), I have never been to a Chinese wedding. Crazy, right? Mike and I kept our wedding untraditional with a simple ceremony, and none of his close relatives have gotten married since we've been together. Since it is my first Chinese wedding, I was a little stressed out about what to wear, so I turned to my friends, Nikoleta and Vicky, who own Best Dressed Charlestown. You may remember last year when I posted about Best Dressed here (still obsessed with that dress), and I knew that they would be able to find me the perfect dress. 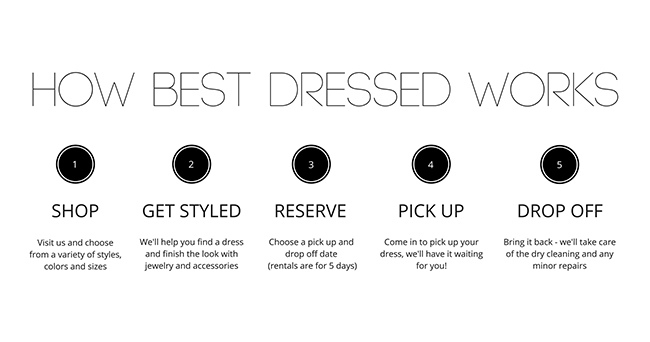 Best Dressed is a brick and motar store, here in Boston, where you can rent designer dresses for any occasion. I love the idea of renting dresses because I'm tired of wearing the same dress over again to many functions, or spending unnecessary money for a new dress that I'll only wear once. The best part is since the store is here in Boston, I can actually go in and try on different dresses in order to find one that fits perfectly. But it doesn't end with dresses. 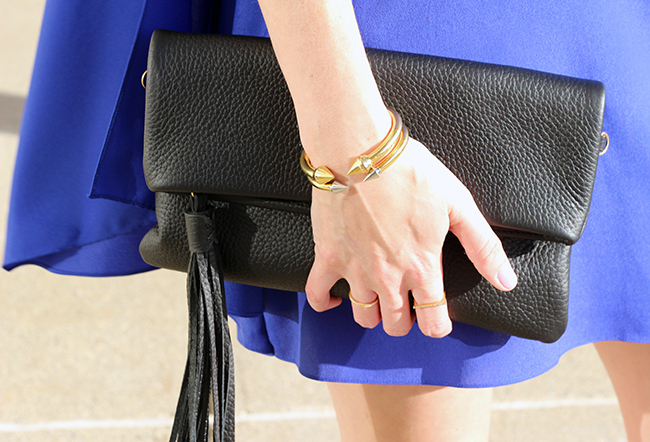 Best Dressed also carries a great selection of bags and jewelry, that you can either rent or buy, to finish your look. They carry GiGi New York bags, which you know is a favorite of mine, and every time I walk into the store, I can't leave without buying jewelry, because it is all so pretty! You can keep your rental up to five days, and the store takes care of the cleaning and any minor repairs. The second I saw this Jay Godfrey cape dress, I was obsessed. Not only did I love the color, but the cape sleeves, and the flow of the dress, made it a winner. I have to be honest that these photos don't do the dress justice. It was very breezy the day we shot this look, that we couldn't capture the best photos. I wish you could see it in person. I finished my looked with black statement earrings, and a GiGi New York clutch, from Best Dressed, then added my fringe heels for a fun touch. Even though I love this look, I decided it wasn't dressy enough for the wedding, but had to share it anyway. I'm thinking it will be a perfect option for the rehearsal dinner. It would also make a great dress for a girls night out, or Boston fashion week event. Either way, I'll find an excuse to wear it. Don't worry, I did leave with the perfect dress for the wedding, and can't wait to show you. Make sure to follow along on Instagram or Snapchat (Rach480) to see what I chose. Wishing everyone a wonderful weekend. 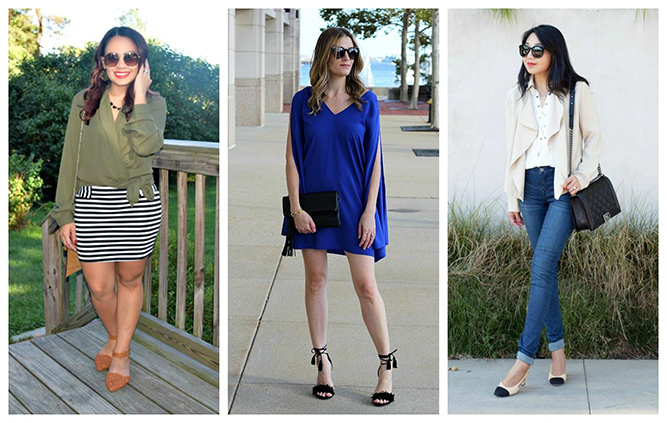 The feature blogger is Nathalie from Earnestyle. 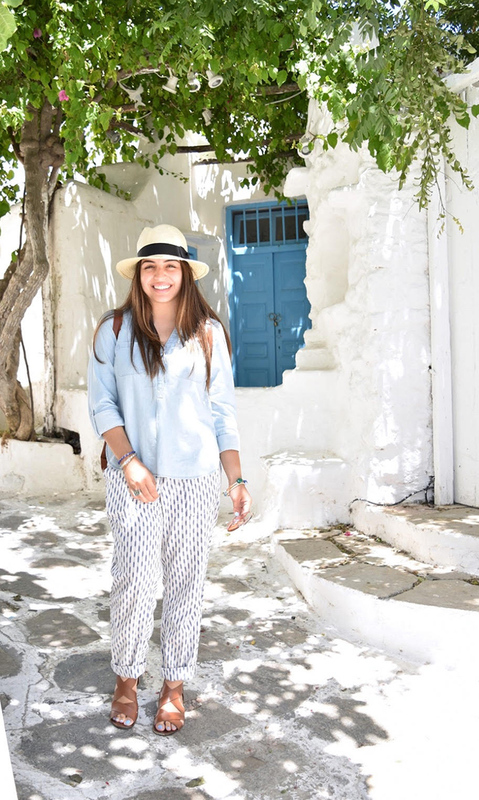 I'm loving this outfit that she wore in Mykonos, and it's making me sad that summer has come to an end. Make sure to visit her blog and say hello!